We're approaching the time of year when the zucchini patch starts run a bit wild. This recipe is a delicious way to keep things under control! Grilled Zucchini Steaks are so fresh and so versatile. They can be enjoyed as a vegetarian main course, a spectacular side or as a potluck finger food. If you've never had chimichurri, prepare to have your mind blown! This traditional South American sauce will bring new meaning to your herb garden. As I understand it, authentic Chimichurri is made with parsley as a base, but as a frugal and creative cook, I prefer to use whatever herbs are looking fresh in the garden. You can make Chimichurri by hand or in your food processor. Whatever your style, have fun with this recipe - it's definitely a keeper! Preheat barbeque grill or cast iron skillet. Place sliced zucchini in a large bowl. Whisk together olive oil, garlic, salt and pepper in a separate bowl & pour over zucchini rounds. Toss until fully coated. Grill zucchini steaks over medium-high heat until they are slightly soft in the middle, with grill marks, about 3-5 minutes each side. Combine all chimichurri ingredients in food processor and let 'er rip! Don't go completely smooth; consistency should be similar to a rough pesto, with bits of leaves still visible. 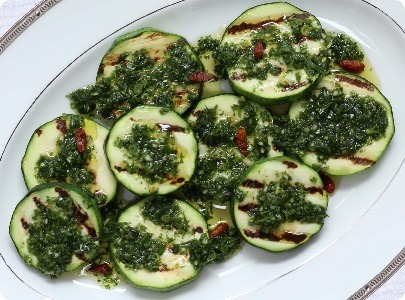 Serve chimichurri immediately over your freshly grilled zucchini steaks! If you have any left over, refrigerate and stir before using again, as the oil will separate.